The voice is that of the dead Billy Sing, a real-life Gallipoli sniper nicknamed ‘The Assassin’ by his fellow soldiers. But it’s an imagined voice- and here the subtitle ‘A Novel’ is important – and it’s a voice that probably belongs more to Ouyang Yu than the character he has created. In writing this review, I googled ‘Billy Sing’ because, I admit, I had never heard of him. In the Wikipedia entry, mention is made of a television mini-series made about Sing, which cast him as European. Queensland National Party member Bill O’Chee, a member of the Billing Sing Commemorative Committee criticized this decision to ‘white-out’ Billy Sing, saying “When a person dies, all that is left is their story, and you can’t take a person’s name and not tell the truth about their story.” Ouyang Yu couldn’t be accused of ‘whiting out’ his Billy Sing. 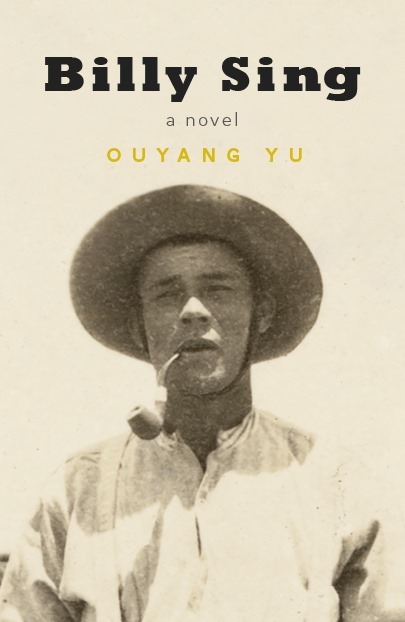 Instead Billy’s mixed race, in an Australia which saw the White Australia policy as a founding issue, is a fundamental part of his personality and story, permeating not just his reputation but also the language with while Ouyang Yu tells his story. The issues of racism and national identity bookend Billy Sing’s life, silenced only by his stint in the trenches at Gallipoli where he shucks off his humanity to become a disembodied killing machine. The subtitle of this book is ‘a novel’. As it happens I finished reading this book just as I read Judith Armstrong’s rumination on the relationship between facts and fiction in her own writing of what she calls ‘biographical novels’ of Sonya Tolstoy and more recently, Dymphna Clark (wife of historian Manning Clark). She describes both these books as a “hybrid method of rigorous research coupled with intuitive interpretation” but found that there was strong marketing and cataloguing resistance to accepting them as ‘novels’, even though that is what she insists they are. Hilary Mantel recently raised similar questions in relation to her own historical fiction, where she described fellow historical-fiction writers as ‘cringing’ when they attached a bibliography. More than ‘fictionalized biography’, these novels – for they all clearly identify themselves as such – stake for themselves a place for imagination and supposition. The authors do not claim to be writing history or biography: it’s a novel. In Ouyang Yu’s case, he has tethered his narrative around a number of factual, documented fenceposts. One is the author Ion Idriess’ diary entry about Billy Sing, another is Sing’s Distinguished Conduct citation. These he cites in a small bibliography at the back. Beyond these, however, the author has let his imagination play. When an author is faced with a dearth of documented material, which is the case here, that very absence can be turned into part of the character him or herself, and this is certainly the case here. Billy Sing asserts that others may scribble, but he will not write. I found this a difficult book to get into. The language was poetic, but strange and didn’t seem to go anywhere. It may be the historian in me speaking here, but it was only when I reached those footnotes and realized that there was a factual basis, that I felt as if I were no longer scrabbling on gravel, trying to get a foothold. It’s the sort of book that I enjoyed more afterwards, once I found out more about the real Billy Sing. The dream-like, insubstantial nature of his telling of his marriage mirrors the historical uncertainty over whether his wife ever came to Australia or not. Dreams and a sordid, visceral reality are intermingled, and it’s a slippery book to read. Did I enjoy it? I really don’t know how to answer. It is only short, and I was able to suspend my anxiety over whether I was ‘getting it’ over 135 pages, while I doubt that I could have done so had the book been 300 pages instead. It’s the sort of book that I enjoyed more after finishing it, and once I’d established the ‘facts’ I was better able to appreciate the artistry and lyricism of the fiction. Somehow, I suspect that this is not the way the author intended his book to be read. Lisa at ANZLitLovers, who has read a lot of Ouyang Yu’s work has reviewed Billy Sing here. Thanks for the mention – I’ll return the favour because I like those links from Hilary Mantel and Judith Armstrong… and they are very pertinent to this book. BTW (asking you in your capacity as an historian)You know how at the end of my review I query the repatriation of Australian soldiers in WW1… I don’t know for sure whether Yu’s made an error or not, and I do understand that it’s a novel and that Yu can play with the truth, but I think in this instance the truth matters. There were generations of people with unresolved grief after WW1 because some – maybe most – of them could never afford to visit the gravesite of their loved one. And this unresolved grief is something that has affected the spirit of the nation, so authors ought to be very careful with it. Yes- I believe that bodies were not repatriated to Australia (Bart Ziino wrote a good book on this), and the predominance of war memorials in every little town in Australia is seen as a form of grieving for bodies that did not return. You’ve read a lot of his work- I tend towards thinking that it’s an inadvertent (though important) error? I suspect it’s inadvertent too… for someone not born in Australia it’s probably something not commonly known – because let’s face it, it was unprecedented and it’s still shocking to most of us. But in Yu’s specific case, it was probably something not suspected or imagined because Chinese culture reveres the ancestors and they wouldn’t have countenanced the idea. (Which is why, I believe, many Chinese migrants went back home from Australia to China when they were old because they wanted to be buried with their ancestors). That’s a long-winded way of saying that it probably never occurred to YU that this could have happened and that he needed to research it. But surely his editor’s antenna should have twitched?